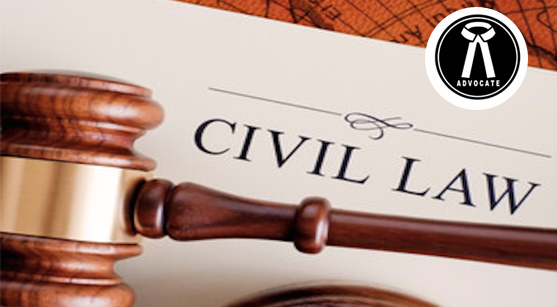 The procedure in a civil case can be complex, and the terminology describing the steps varies across India. Generally, a suit goes through pleadings, documents and the trial itself. A suit begins when the plaintiff files a pleading with the court to set out the plaint against the defendant and the remedy the plaintiff is seeking. This pleading may be called a civil suit for possession, suit for a declaration. When the pleading is filed, a Civil court issues the notice to defendant for giving his appreance on next date fixed by the Court. Copies are then delivered to, or “served on,” the defendant. The defendant after giving his appreance, file the written statement (Reply of the plaintiff’s pleading) for denying the false allegation against him/her before the court. If she or he does not file any reply, the court will assume that the plaintiff’s allegations are true, and the defendant may thus lose by default. Both the plaintiff and the defendant are entitled to consult an Advocate for assistance. Advocates representing each side often discuss the lawsuit in an effort to settle it before a trial is necessary. A settlement can be reached at any time/any stage of the case before the court makes his or her decision. In fact, only about two percent of civil suits are actually tried before the courts. After plaintiff’s case and defense’s reply are filed, each party is entitled to an “examination for discovery” before the trial. This examination is intended to clarify the claim against the defendant and to let each side examine the evidence that the other side intends to use in court. The dispute may then proceed to trial. During the trial, it is up to the plaintiff to present facts to support the claim against the defendant. In a civil suit, the plaintiff must prove that it is probable that the defendant is legally responsible, or “liable,” as a civil case is decided on a balance of probabilities. If the facts justify the remedy the plaintiff is seeking, the court will hold the defendant liable. The trial begins with the plaintiff presenting evidence against the defendant. The plaintiff may call witnesses to testify to facts and present papers, photographs or other kinds of evidence. The defendant may cross-examine the plaintiff’s witnesses to test their evidence. The defendant then presents his or her own evidence, including witnesses. The plaintiff has the same right to cross-examine. Throughout the trial, the court must make sure that all the evidence presented and all the questions asked are relevant to the case. For example, in most situations, the court will not allow “hearsay” evidence, testimony based on what a witness has heard from another person. At the conclusion, both the plaintiff and the defendant summarize their arguments on the basis of their evidence and precedents related to the present case. The court must then consider the evidence presented before making a decision, based on what has been proven to be most probable. He or she must decide whether the facts show that the defendant has broken a civil law or not? After heard the argument or considering the evidence of the both the parties, If the defendant is found to be not legally responsible or liable on a balance of probabilities, the court will dismiss the case. If the defendant is found liable, the court must consider the remedy that the plaintiff asked for in the pleadings, the facts, and the authority to grant specific relief before deciding how to compensate the plaintiff. Remedies can be monetary, declaratory or injunctions. Monetary remedies, called “damages,” are the most common. The court who decides the case normally fixes the amount of damages. The court will take into account the expenses incurred by the plaintiff and, where the law permits, an additional sum to compensate the plaintiff for the loss suffered or that might be suffered in the future as a result of the wrong doing of the defendant. The court is not required to award the amount asked for by the plaintiff; they may, in fact, award less than the amount claimed. A court may occasionally award “punitive” or “exemplary” damages beyond compensation to the plaintiff. Such damages are usually awarded when possible under a law or when the court feels that the conduct of the defendant was so offensive that an increased award is required to express the disapproval of the community.